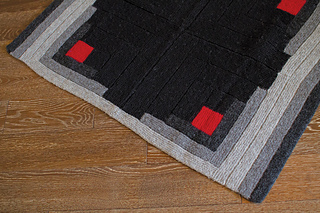 Inspired by the log cabin quilt pattern, Holli created a modular knit blanket that uses a traditional structure with a contemporary colour choice. 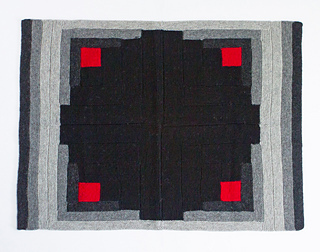 We love the effect of the graphic greys, charcoal and black, with that pop of red to represent the hearth. The blanket is made all the cozier with a slight fulling in the finishing. 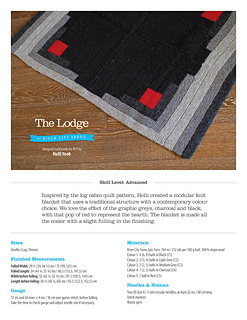 The pattern is written for three sizes: Stroller (29.5” x 34”), Lap (39” x 45”), Throw (48.5” x 56”) and is cleverly knit using a modular technique in a warm and cozy 100% wool: River City Yarns’ Epic.